Determine the best diluent for intrathecal application fluorescein (hypodense compared to CSF) and establish an easy, simple, safe and reproducible method for the application of intrathecal fluorescein in these patients. 10% fluorescein dilutions were performed: 0.1 mL fluorescein + 10 mL of 4 solutions: Cerebrospinal fluid, normal saline, sterile water and double distilled water for injection; the density of each mixture was measured, looking for the most hypodense. Dilution protocol and intrathecal application of fluorescein was established, to avoid complications. Cerebrospinal Fluid (CSF) as a density of 1.004, when combined with fluorescein as a density of 1.005 which makes hyperdense and therefore it is necessary to put the patient in Trendelenburg position for at least 30 minutes. The most hypodense solution in comparison with CSF was using double-distilled water as diluent. We used a described application protocol of a fluorescein + DDW solution in 10 patients, 80% had rinorraquia dyed immediately after application and 20% took 20 and 35 minutes. 100% had positive endoscopic examination for CSF staining. In all cases the leak in the cranial base was identified and sealed without complications. The intrathecal injection of a hypodense solution of sodium fluorescein allows more accurate, fast and safe endoscopic approach without placing the patient in the Trendelenburg position or wait a long time before the surgical procedure. Cerebrospinal Fluid (CSF) leaks occur when there is a positive pressure gradient through a defect in the skull base covering layers: Arachnoid, dura, skull base bone and sinonasal mucosa [1-5]. This defect may have different etiologies: Posttraumatic, postsurgical or idiopathic, the latter of which is defined as an appearance of a leak without history of trauma or surgery. The use of sodium fluorescein to detect suspected cases of CSF leak began in 1960 [2,3,5]. Kirchner and Proud were the first to describe the use of Intrathecal Fluorescein (ITF) to identify and locate CSF leaks through the nose (rhinoliquorrhea) and otorrhea with suspected CSF leak in 1961 [2,3,6]. Severe complications have always been related to fluorescein overdose that causes a direct irritant action and chemical meningeal trauma, as described by Syms et al., in an experimental study in dogs . This procedure, which involves the injection intrathecal dye (fluorescein) is widely accepted and used in Europe by Wolf, Lund, Stammberger, Simmens, Castelnovo, EPOS, et al. ; in Oceania by Wormald, Harvey, Teo, Sethi; in South America by Stamm, Herrera, Haddad and others; and in North America by Carrau, Locatelli, Kassam, Cassiano, Kennedy and Palmer, to name a few [6-9]. In the US, the FDA doesn’t account nor prohibits its use in this context, therefore, ITF as assistance in CSF leaks is considered an off-label use [1,2]. In Mexico with COFEPRIS there is a similar situation as with the FDA. Whenever the procedure is done, it requests a specific informed consent where the benefits and possible complications are explained to the patient. Since 1996, Drs. Alfredo Mascareño and Eugenio Salas have used this method in more than 90 cases with great success (with only two re-interventions that were successful in a second surgical attempt). They had a patient with a non-fatal major complication (chemical meningitis), the cause was reported as an overdose, with 2.5mL of 10% fluorescein solution were applied (250 mgs) (Personal communication). Among those applying fluorescein, there is always a discussion of what is the best diluent and why. This discussion arises because it has been found that the diluent used affects the speed in which fluorescein reaches the cranial cavity. This is because the density of the solution applied intrathecally with respect to the density of the CSF. The more hypodense the solution is, the fastest it reaches the cranial cavity without setting the patient in Trendelenburg position. For many years fluorescein has been diluted with CSF, this mixture results in a hyperdense solution compared to the patient’s CSF. For this reason, it is necessary to put the patient in Trendelenburg position for 30 to 40 minutes before surgery so that the fluorescein reaches the brain cisterns and is displayed in the nasal endoscopic examination [1-3,5]. There are also reports of Sterile Injectable Water (SW), Normal Saline (NS) and Double Distilled Water (DDW) usage as diluent with fluorescein. However, while all solutions result in CSF dyeing and its display, a hyperdense mixture takes much longer to appear in the surgical field. Based on this, the main objective of this study is to determine which diluent is more hypodense and this allows for faster diagnosis and location of the fistula. We also want to establish an easy, simple, safe and reproducible method for the application of ITF in these patients [6,7,10]. Lumbar puncture procedure is done with patient monitoring with pulse oximetry, blood pressure and electrocardiogram. Sedation is based on fentanyl and midazolam. Premedication is done with diphenhydramine 50 mg and intravenous dexamethasone 8mg. With the patient in left lateral decubitus, an interspace in the lumbar spine (L2-L3 or L3-L4) is chosen. Asepsis and antisepsis with iodine it is carried out. The excess is cleaned with alcohol. The skin is infiltrated with local anesthetic lidocaine 1%, the puncture is performed with Whitacre needle pen tip number 25, the subarachnoid space is reached directing the mandrel in cephalic direction, splinted with the aim of Whitacre needle does not lose its edge and is more uniform in its entry to the dura. It is also less traumatic, avoiding post puncture headache. 10% fluorescein is used (1mL has 100 mg). An insulin syringe is loaded with 1 to 2 tenths of this concentration (10 to 20 mg). The dilution is then made using the fluorescein described and 10 ml of DDW, making this solution hypodense. The administration should be slow, paying attention to the patient’s vital signs and asking their clinical status. Fluorescein application should be done with patient consent. Ask the patient to change position (sitting, standing, bending) and identify side effects that may arise (Figure 1). As described before, densities were determined for fluorescein solution prepared with different diluents. When the mixture is done with CSF, the density acquired was 1.005, this makes the solution hyperdense in comparison with normal CSF density (1.004). Because of that, for the fluorescein + CSF mixture to work in detecting CSF leaks, it is necessary to put the patient in Trendelenburg position so that it rises to the cranial cavity in approximately 1 hour. If the mixture is done using NS, the final density is also hyperdense in comparison with CSF, so the same results should be expected as with the fluorescein + CSF solution. In addition, because of the similarities between this mixture and CSF in terms of composition, it is rapidly absorbed in the choroid plexus, limiting its rise and duration. The biggest difference is found when the mixtures were made using DDW and SW. In this case the resulting solutions were hypodense in comparison with normal CSF. As stated before, the more hypodense the solution the faster it will reach the cranial cavity, even without the patient in a special position. Applying a hypodense fluorescein solution also allows for greater accuracy, speed and security in the surgery, without placing the patient in Trendelenburg position and without waiting for long before starting the surgical approach. We applied the dilution protocol and application described before (using DDW as diluent), in 10 patients, they were all women who had a diagnosis of cerebrospinal fluid leak and that underwent endoscopic endonasal closure. In all patients we used Whitacre needle pen tip number 25 for lumbar puncture. None of our patients presented headache post puncture or other complications related to the lumbar puncture. In 8 of the 10 patients a stained CSF was observed at the end of the application procedure, with the patient being awake and sitting (Figure 2). The remaining 2 patients had low output leak and stain was found until after intubation. Endoscopic examination yielded a positive fluorescein staining in 100% of patients, which confirmed the diagnosis, located the fistula and ensured a tight seal (Figure 3). The basic principle of treatment of cerebrospinal fluid leaks is that the defect site must be precisely located, prepared, sealed and allowed to heal [3,7,11-13]. ITF can be used to identify the most challenging defects, discover multiple leak sites, and ensure a complete repairing, as well as checking of the seal. ITF is an important diagnostic tool in cases of low flow, intermittent craneosinusal leaks or hidden rhinorrhea (within a sinus) . The use of blue or yellow filter on the telescope is very useful for improving vision of fluorescein in low flow leaks [2,3]. Wolf et al., reported in 1977 his experience in 925 patients who were administered ITF via sub occipital and lumbar . This is one of the most important articles published in this issue, and to date, is the largest series done. It only reported 3 cases of seizures. They insist that the dose must be equal to or less than 1 ml in a mixture of 5% (a total of 50 mgs of sodium fluorescein). Oberascher & Mecodidn’t report any complications in 900 cases [3,4]. Keerl et al., have 420 published cases, with only 7 major complications and one death (In this case the patient was administered 500 mg of fluorescein). In all cases complications arose from an incorrect dosification [2,3]. Moseley et al., (1978) reported limb weakness thatdisappeared within 48 hours after administration of 25 mg of fluorescein . Placantonakis et al., proposed consistent patient premedication with dexamethasone and diphenhydramine for protection against chemical meningeal irritation. One study reported that the FDA has received 136 cases of severe adverse effects of intrathecal fluorescein and 13 patients have died due to them between 1969 and 2003.One of the limitations to the use of fluorescein is reported complications, most commonly due to incorrect dosing . In Mexico since 2010, Salas-Zavala et al., standardized the dilution to 0.1mL of a 10% sodium fluorescein solution for intravenous use applied intrathecally by lumbar puncture diluted in 10 mL of DDW to reduce the risk of meningeal irritation. Based on these experiences, the literature points almost unanimously that sodium fluorescein can be administered safely with a maximum of 0.5 ml of a 10% solution (50 mg) as total dose. Fluorescein must be mixed with DDW (ideally 10 mL) and slowly injected into thelumbar column . In some published articles the placement of intravenous fluorescein while intrathecal to avoid it being diluted during the surgical event. It is believed that this can be absorbed in the choroid plexus and cause CSF coloring. However, intravenous fluorescein doesn’t increase visibility, but does increase the potential adverse effects [8,14]. The benefits of fluorescein lie on its ability to improve CSF visualization, facilitate the identification of the leak (especially in cases of multiple leaks) and help verify the seal of the repair at the end of the procedure. It has been shown that intrathecal fluorescein as a sensitivity of 73%, a specificity of 100% and a false negative rate of 26% . The contraindications to fluorescein placement are epilepsy, hydrocephalus, spinal stenosis, acute brain injury and brain edema. Complications reported with its usage are chemical meningitis, bacterial contamination and subarachnoid hemorrhage . Their identification sometimes can be challenging because their most common symptoms, such as malaise and headache, are unspecific and therefore difficult to determine whether they are inherent to the surgical procedure or secondary to the administration of fluorescein. They usually disappear within a few hours [7,14]. Rare symptoms that have been reported are transient paraplegia, seizures and permanent tinnitus [7,14]. Currently, the placement of ITF in repairing leaks via transnasal endoscopic is helpful for locating the leak. The fluorescein-related complications are almost always related to its dosage. The use of ITF is not prohibited, but neither is FDA approved. Because of this a specific informed consent about ITF and its application should be always applied, clearly explaining to the patient what the benefits and complications that can occur and their possibility of occurring. Intrathecal application of a hypodense mixture of fluorescein, specifically using DDW as diluent, allows more accurate, fast and safe endoscopic approach without placing the patient in Trendelenburg position or waiting a long time before the surgical procedure. Over-dosage is the main reason the use and dissemination of ITF has lowered its reputation. ITF, along with a tomography and an MRI on T2 extended to myelographic effect are the gold standard in the evaluation and management of the closure of these leaks. We believe that ITF placement is an effective tool to ensure the quality of the closure and identifying the site of the leak. Therefore, by putting fluorescein at the beginning of the procedure, we enhance the visualization tools, an essential step for a complete and proper closure despite the etiology. Javadi SA, Samini H, Naderi F, Shirani M (2013) The use of low-dose intratecal fluorescein in endoscopic repair of cerebrospinal fluid rhinorrhea. Arch Iran Med 16: 264-266. Felisati G, Bianchi A, Lozza P, Portaleone S (2008) Italian multicentre study on intrathecal fluorescein for craniosinusal fistulae. Acta Otorhinolaryngol Ital 28: 159-163. Bernal-Sprekelsen M, Rioja E, Enseñat J, Enriquez K, Viscovich L, et al. (2014) Management of anterior skull base defect depending on its size and location. BioMed Research International. Silva LRF, Santos RP, Zymberg ST (2006) Endoscopic endonasal approach for cerebrospinal fluid fistulae. Minim Invas Neurosurg 49: 88-92. Banu MA, Kim JH, Shin BJ, Woodworth GF, Anand VK, et al. (2014) Low-dose intrathecal fluorescein and etiology-based graft choice in endoscopic endonasal closure of CSF leaks. Clin Neurol Neurosurg 116: 28-34. Demarco RC, Tamashiro E, Valera FC, Anselmo-Lima WT (2007) Use of a hypodense sodium fluorescein solution for the endoscopic repair of rhinogenic cerebrospinal fluid fistulae. Am J Rhinol 21: 184-186. Guimarães RE, Stamm AE, Giannetti AV, Crosara, PF Becker CG, et al. (2015) Chemical and cytological analysis of cerebral spinal fluid after intrathecal injection of hypodense fluorescein. Braz J Otorhinolaryngol 81: 549-553. Mathias T, Levy J, Fatakia A, McCoul ED (2016) Contemporary approach to the diagnosis and management of cerebrospinal fluid rhinorrhea. The Ochsner Journal 16: 136-142. Fokkens WJ, Lund VJ, Mullol J, Bachert C, Alobid I, et al. (2012) EPOS 2012: European position paper on rhinosinusitis and nasal polyps 2012. A summary for otorhinolaryngologists. Rhinology 50: 1-2. Guimarães R, Becker H (2001) A new technique for the use of intrathecal fluorescein in the repair of cerebrospinal fluid rhinorrhea using a hypodense diluent. Rev Laryngol Otol Rhinol (Bord) 122: 191-193. DeConde AS, Suh JD, Ramakrishnan VR (2015) Treatment of cerebrospinal fluid rhinorrhea. Curr Opin Otolaryngol Head Neck Surg 23: 59-64. Kaptain GJ, Kanter AS, Hamilton DK, Laws ER (2011) Management and implications of intraoperative cerebrospinal fluid leak in transnasoseptal transsphenoidal microsurgery. Neurosurgery 68: 144-151. Raza SM, Banu MA, Donaldson A, Patel KS, Anand VK, et al. (2016) Sensitivity and specificity of intrathecal fluorescein and white light excitation for detecting intraoperative cerebrospinal fluid leak in endoscopic skull base surgery: A prospective study. J Neurosurg 124: 621-626. Jacob AK, Dilger JA, Hebl JR (2008) Status epilepticus and intrathecal fluorescein: Anesthesia providers beware. Anesth Analg 107: 229-231. Figure 1: Dilution technique and application of ITF. (a) 0.1mL of a 10% fluorescein solution (10mg) is collected. (b) It is diluted in DDW up to 10mL. (c) Puncture is performed at the L3-L4 intervertebral space, it is splinted with a 20-gauge needle and whitacre needle pen tip 25 is placed in the subarachnoid space. (d) The fluorescein solution is injected into the intrathecal space in 5-10minutes. Figure 2: CSF stained with fluorescein. Patient sitting, five minutes after application. Nasal endoscopy without filter can be seen. 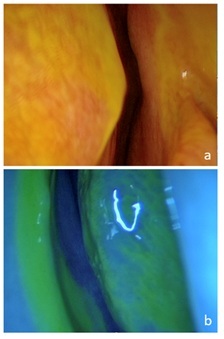 Figure 3: Endoscopic examination after the application of ITF. (a) Right anterior cribriform plate dyeing liquid. (b) Same patient, blue filter accentuates color. Table 1: Densities and Characteristics of the different dilutions that have been used for the application of intrathecal fluorescein. Citation: Lozano PA, Talamas LMG, Galicia JES, Villagómez MAZ, Méndez MC, et al. (2018) Hypodense Sodium Fluorescein for Diagnosis and Skull Base Cerebrosspinal Fluid Leak Repair. J Otolaryng Head Neck Surg 4: 023. Copyright: © 2018 Lozano PA, et al. This is an open-access article distributed under the terms of the Creative Commons Attribution License, which permits unrestricted use, distribution, and reproduction in any medium, provided the original author and source are credited.